The theme was Minimalism, a somewhat vague theme. Anyways, ideas about making a black-and-white Tetris or Pacman game were bouncing inside my head. After a couple minutes, the idea of making something using a maze appeared. 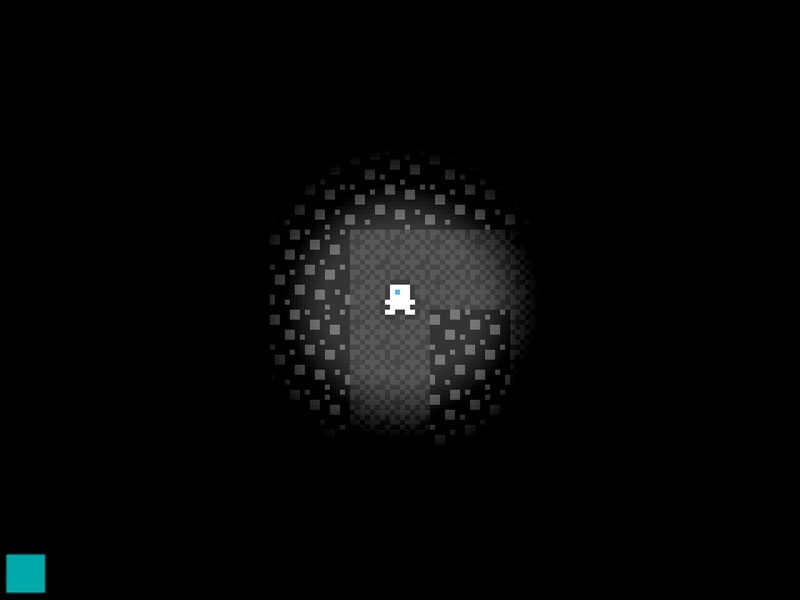 Inside this dark maze, the character will have to bounce from one wall to the other to find the exit. The character would run into a couple flashlights that would help her light the way out, but the effect won’t last much longer. This time I felt really good creating and animating the game’s sprites. I like a lot the 8-Bit pixelated style so I tried to emulate it to design the character and the surroundings. The sound effects were trickier to get done but I think the result is acceptable. Finding the sound effect for when the character find a flashlight or when she’s hitting a wall was particularly difficult. The game’s development wasn’t as organized as it was in the last participation. I wasted a lot of the time fixing bugs. I also abused on reworking things that were already running fine. At three hours to submission, I didin’t have the sprites ready. The only thing I had was the first level and I even didn’t have a start screen. At the end, those three hours vanished so quickly I didn’t have the chance to finish the game. If you play it, you will notice some weird green boxes at the lower left… Those are the flashlight inventory without textures ‘:). I’m now completely convinced that you need a simple and concrete idea from the begining in order to deliver something valuable at the end of the competition. Also, don’t push too much on making things perfect. The simpler the better. This becomes more important when you only have 48 or 72 hours to finish a game :). Here’s the timelapse video from this Ludum Dare participation. I hope you enjoy it. You can playe the game here.